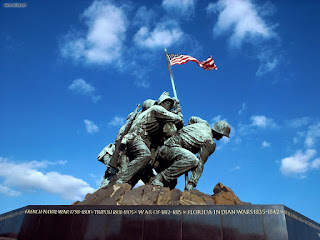 Memorial Day is a United States federal holiday observed on the last Monday of May (May 30 in 2011). 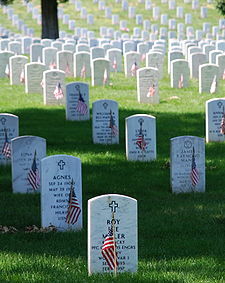 Formerly known as Decoration Day, it commemorates men and women who died while in military service to the United States. First enacted to honor Union and Confederate soldiers following the American Civil War it was extended after World War I to honor Americans who have died in all wars. By 1865 the practice of decorating soldiers' graves had become widespread in the North. The first known observance was in Boalsburg, Pa on October, 1864, and each year thereafter. The friendship between General John Murray, a distinguished citizen of Waterloo, and General John A. Logan, who helped bring attention to the event nationwide, was likely a factor in the holiday's growth. On May 5, 1868, in his capacity as commander-in-chief of the Grand Army of the Republic – the organization for Northern Civil War veterans – Logan issued a proclamation that "Decoration Day" should be observed nationwide. It was observed for the first time on May 30 of the same year; the date was chosen because it was not the anniversary of a battle. There were events in 183 cemeteries in 27 states in 1868, and 336 in 1869. The northern states quickly adopted the holiday; Michigan made "Decoration Day" an official state holiday in 1871 and by 1890 every northern state followed suit. The ceremonies were sponsored by the Women's Relief Corps, which had 100,000 members. By 1870, the remains of nearly 300,000 Union dead had been buried in 73 national cemeteries, located mostly in the South, near the battlefields. The most famous are Gettysburg National Cemetery in Pennsylvania and Arlington National Cemetery, near Washington. 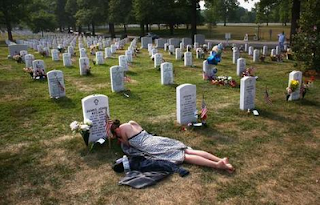 The Memorial Day speech became an occasion for veterans, politicians and ministers to commemorate the war – and at first to recall the atrocities of the enemy. They mixed religion and celebratory nationalism and provided a means for the people to make sense of their history in terms of sacrifice for a better nation, one closer to their God. People of all religious beliefs joined together, and the point was often made that the German and Irish soldiers had become true Americans in the "baptism of blood" on the battlefield. By the end of the 1870s the rancor was gone and the speeches praised the soldiers of both the Union and Confederacy. By the 1950s, the theme was American exceptionalism and duty to uphold freedom in the world. Ironton, Ohio lays claim to the nation's oldest continuously running Memorial Day parade, since 1868. In 1882, the name of Decoration Day was formally changed to Memorial Day in "memory" and 'honor" of those who gave their lives fighting for a common cause, America.